Enjoyed Tim Pollak’s helpful explanations and commentary. Thanks, Tim! I’d love to know what the aroma of the flower is when it really blooms! To describe it yourself, Nora, you’ll have to visit in person and take a sniff! But researchers have described it as a combination of scents, meant to mimic a carcass in a particular state of decomposition—not too old, not too fresh. This is to attract carrion beetles looking to lay eggs on a good food source. In the process, they pollinate the plant. Read more about it here. Typically how often do these plants bloom? Do they grow from a”bulb”? Do they have a dormant period? Dennis, when grown from a seed, the first bloom of the plant takes the longest. 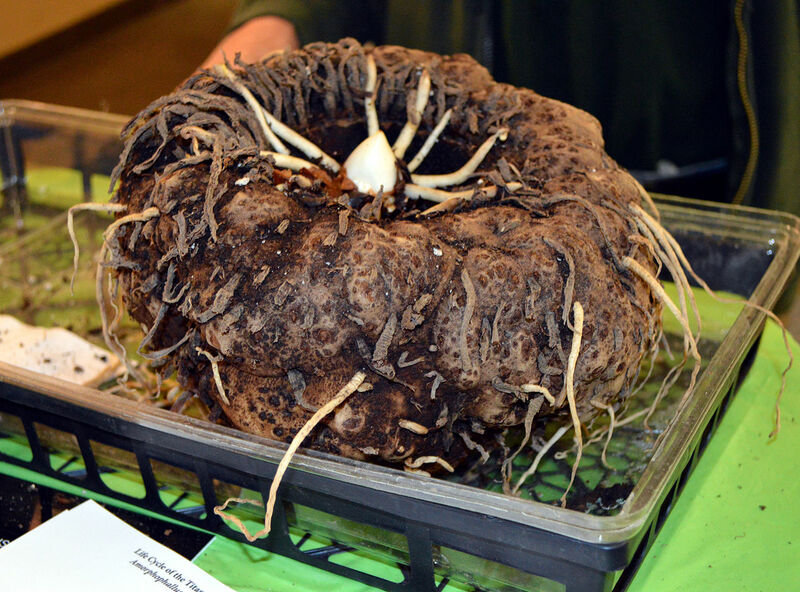 It usually takes 7–10 years for the seed to develop into a corm large enough to support a bloom. Spike took 12! The corm functions a lot like a bulb. As each leaf growth dies back, the energy from that leaf cycle returns to the corm, and the corm grows larger. Between each leaf growth or bloom there is a dormancy period of around 12 months. Once the corm is a large enough size (like Spike is now), it can bloom again as soon as 2 years, but 3-7 years between blooms it more typical. The live cam provides a wonderful tool to watch the flowering progress 24/7. I’m just wondering if the around the clock illumination does not have adverse effect on reaching the full bloom stage? In natural settings in Sumatra there is approximately 12 hours of daylight followed by 12 hours of total darkness. Hi, Richard. This is something many webcam viewers mention, and definitely on our radar—as well as humidity in the room. We hope that by having our lights off last night we reminded Spike that it’s time to bloom! We were there a few weeks ago when Spike was 38″ and we were there last night. It is so massive! We noticed that a spider and fly were attracted to it. I’ve been watching daily on the webcam and sometimes see you in the morning checking it and measuring it and the frustration of it being so slow. I was wondering about leaving the lights on all night was affecting it’s growth. I think that it was a great idea to leave it in the dark at night in order for it to “sleep” and go through its natural evening cycle. This morning, I noticed that you were smelling the plant and wondered if it is starting to “stink”. Also, the webcam is not as focused as it used to be. Is there a way to adjust it? I am coming back either tonight or tomorrow and probably Sunday. Thanks for taking great care of this highly unusual plant. Debi, thank you! This is definitely the learning experience of a lifetime! 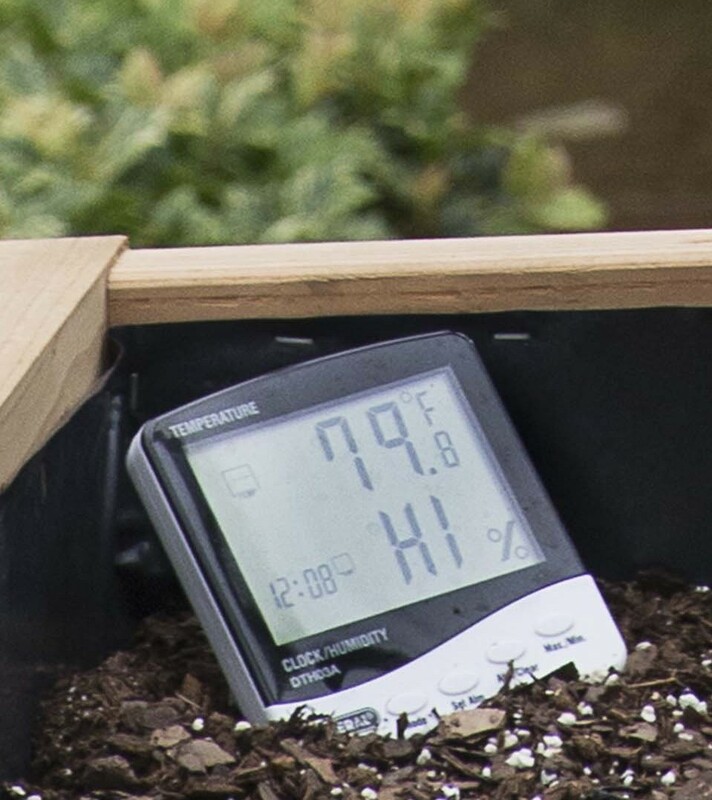 We are in conversation with other botanic gardens about our various blooms’ progress, and one of the major factors we are dealing with at the Garden has been keeping a constant high level of humidity for Spike, who comes from a very steamy environment. Having the lights out last night was definitely part of the plan to get Spike’s clock to kick in that it’s bloom time, but be prepared for new, higher levels of humidity when you visit in person to see the bloom. Since you are one of our many webcam stalkers, I will admit we did notice a slight odor when standing right next to the plant this morning. We are hoping to have something to announce soon. Tim, I need to know: Are you sleeping with Spike these days? I am very concerned about Spike feeling unloved when it finally opens. Now that the lights are out at night, I can’t even make sure all is well when I wake up at 2:00 am. Please assure us you are there, encouraging it, protecting it, and maybe even hugging it from time to time. Spike’s height has not changed for the last six days. Could you please let us know about its girth and what that might indicate? Spike might be male, but ai still look at it as a pregnant lady. Am I wrong to think that way? My concern about the Day time hours getting shorter after june 21 for flowering and loosing energy to bloom. of these mighty flowers to bloom? Craig, we investigated the lights used for the live webcam at night, especially after we realized Spike was not going to bloom on its own. 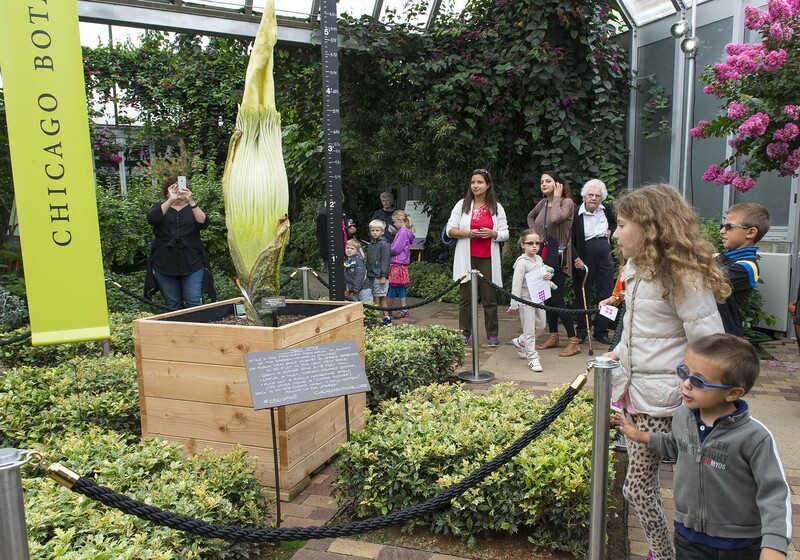 There is no evidence or reports of any effect of using lights that would have caused the titan arum not to bloom. In fact, other gardens and universities have used similar lighting for their cameras in the past that they said did not have any impact on flowering or not. We knew from the beginning that sometimes the flowers do not open up fully or at all both in cultivation and the wild, as that has been well-documented in the past. 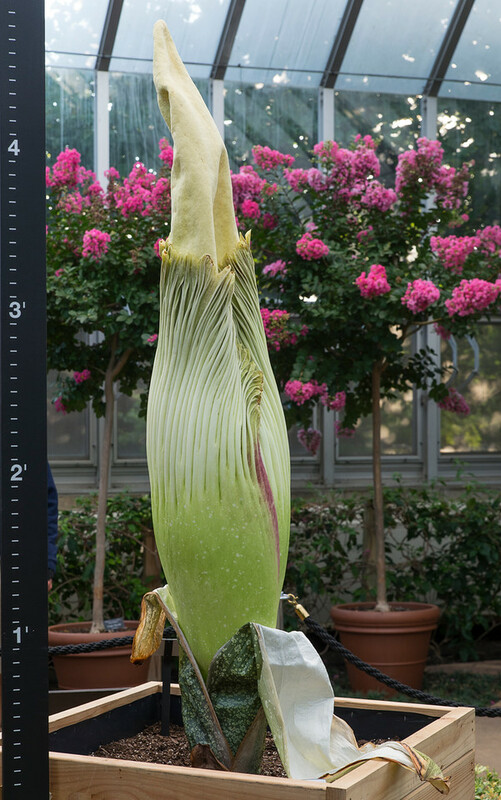 So, we still do not fully know the exact reason why Spike did not bloom, other than it did not have enough energy to open by itself… we are continuing to learn more about these fascinating plants, and will do whatever it takes to get one to bloom in the Chicago area again very soon. Even though Spike didn’t bloom as we all hoped…the whole “Spike experience” orchestrated by the garden and all the specialists working with Spike was just fantastic. I loved learning about these plants through frequent visits and reading the informational website. Best of all was the opportunity to monitor growth through the live cam; we viewed Spike all the time from home. Thus, I write to thank you and encourage you on the next efforts with these amazing plants! I have one of these now going into its 3rd year with me. It is about 3 feet tall this season with a newly opening umbrella of leaves. Can you please tell me what fertilizer to use? I can’t find any information on that. Next Next post: Can Spike’s “Perfume” Be Captured in a Jar?